Here is our Mighty Eagle Total Destruction video walkthrough for Angry Birds Seasons The Pig Days Level 1-1. 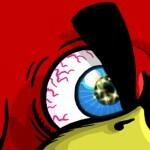 Looking for Angry Birds Seasons 3-star walkthroughs? Head over here ». Land the Sardine Can into the antenna of the rover and it comes to rest against the base rock. Hitting the antenna keeps it from flying up due to the lack of gravity.